Motorland Student Curator, Caleb Delano, age 15, won first place at the National History Day competiton and will represent Maine at the national competition in June. His topic is on the Rwandan genocide, and he holds a “blood plate”, one of the tools of genocide along with the newly designed Rwandan flag. Caleb Delano won first place at the National History Day competition and will represent the State of Maine at the national competition in Washington in June. Delano, age 15, is the historical exhibition student curator intern at Motorland, a showroom and gallery in Biddeford. Delano captured top honors in the Solo Performance, Senior Division category at the state competition held at the University of Maine, Orono on April 12th. “We are so proud of Caleb and his achievement,” says Tim Stentiford, owner of Motorland and creator of an innovative internship program for high school students. Home-schooled in East Waterboro, Delano worked with Motorland to pick an automotive history topic that fit the theme of rights and responsibilities for the National History Day student competition. 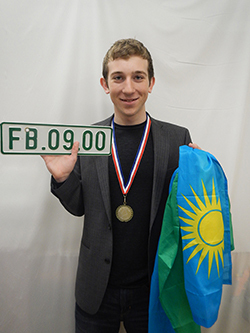 Working with Motorland’s extensive license plate collection, Delano found a license plate from the east African nation of Rwandan that is called the “blood plate”. As the world solemnly commemorates the 20th anniversary of the Rwandan genocide of 1994, where more than a million people were killed in a brutal ethnic cleansing campaign over a few short weeks, Delano was inspired to tell the story of the genocide to his generation, students today who were born after the horrific tragedy. Delano’s presentation is called “The Frequency of Fear: Rwandan Genocide” and is an eight-minute performance that teaches people about the tragedy through characterizations of principals on both sides of the genocide. “Caleb blew us away with the raw power of his simple presentation and the message he had about the importance for all generations to learn about genocide,” says Stentiford. Delano learned that the brutal slayings were carried out, not with nuclear weapons or assault guns, but with simple household items: license plates, radio broadcasts, and knives. “The Hutu guerillas would broadcast the license plate numbers of their rival Tutsi people, allowing them to be hunted down in the street, pulled from their cars, and hacked to death and left dying in their own blood,” explains Delano, recalling the chilling events. “I was overwhelmed when I heard my name called,” says Delano after receiving a gold medal and invitation to compete in nationals. Delano will stage his performance at the opening of his historical exhibition at the Motorland Gallery on Friday, May 27th from 5:00 p.m. to 8:00 p.m., as part of the Biddeford-Saco Art Walk. Delano will repeat his performance during the Heart of Biddeford Secret Places Hidden Places event on Saturday, May 28th, also at the Motorland Gallery. In June, Caleb will join a delegation of other student winners from Maine who will participate in the 35th National History Day competition, from June, 15-19, 2014 at the University of Maryland College Park, just 10 miles outside of Washington D.C. Delano will compete in the senior division with high school students from all 50 states and six territories. For more information, call Motorland Gallery at 207.710.6699 or go online to motorlandamerica.com.